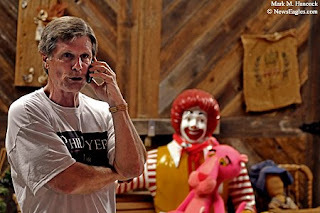 Phil Dyer calls to a friend during an election party in Rutledge Haggard's private barn in Plano on Saturday, May 9, 2009. 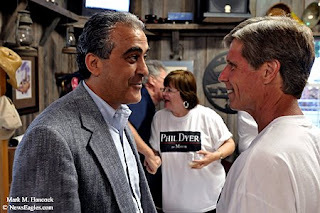 Phil Dyer (right) talks with Raed Maso, older brother of Frisco mayor Maher Maso, (left) during an election party in Rutledge Haggard's private barn. Phil Dyer writes a check while his wife Margaret (left) and unopposed Place 4 city council candidate Lissa Smith (right) have a silent exchange during an election party in a private "party barn." 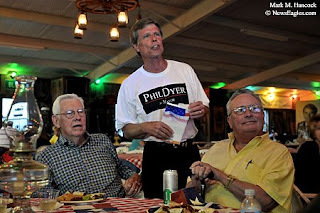 Phil Dyer (center) watches election results with Rodger Mitchell of Dallas (left) and Richard Silk of Plano (right) during an election party. Phil Dyer talks on a phone during an election party in Rutledge Haggard's private barn in Plano. 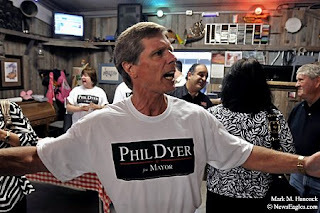 Phil Dyer was favored to win the Plano mayoral race. 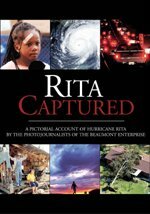 The final image moved beyond the news and became a curiosity piece on DMN's Plano blog.